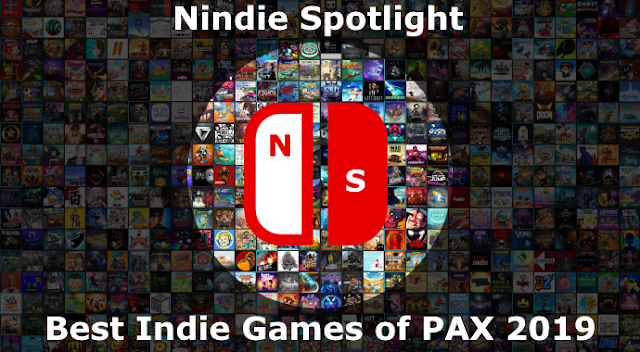 So far the shooter genre has been pretty well-represented on the Switch, specifically when it comes to the twin-stick variety. That said, I can easily say none of them have been quite like Rive, which really takes an arcade-style base and then amps up the intensity substantially. 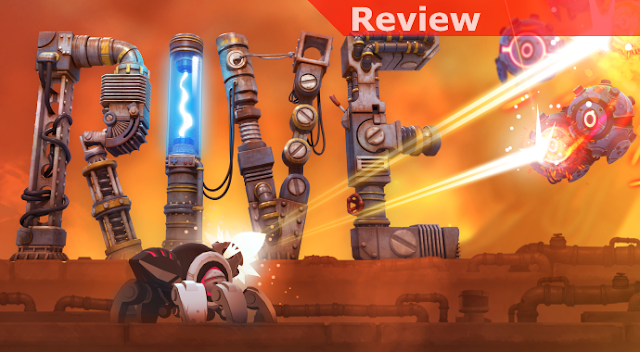 Not content with just being a solid shooter Rive also throws in some jumping and a variety of extras like gravity bubbles and fast-moving trains to keep you just a little off-balance but consistently engaged. 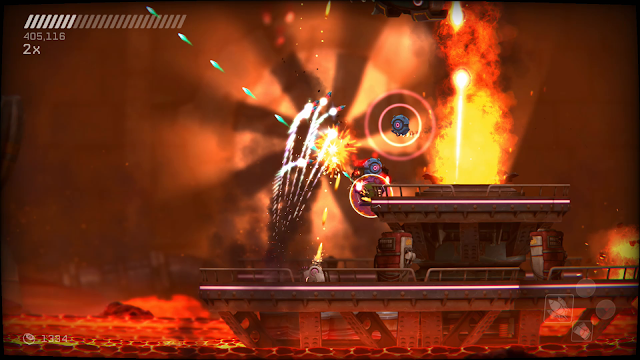 In Rive you’ll take control of the gruff but somewhat funny Roughshod and his pretty maneuverable Spidertank. With all of the craziness that awaits you in the space station you happen upon, care of your in-game robotic AI foil Daryl Lloyd-Lancaster, your goal is to escape but you’ll have to overcome some substantial challenges to do so. As you progress you’ll get the ability to hack some of the robots you encounter and these will help give you a bit of help in a variety of ways though none of them lasts very long. Don’t worry, most of the time you won’t tend to survive too long either. The main thing to understand in Rive is that it’s tough, at times brutally so. While familiarity can help you greatly in surviving, so you do get better as you go along, the game is constantly challenging you with swarms of enemies to shoot at while at the same time things going on in the environment complicate matters. Whether you’re situated on a small platform in the middle of lava, on a conveyor belt that is shifting you around while giant metal pistons crush anything that gets under them, or trying to move between gravity bubbles it is the combination of twin-stick shooting and sometimes tricky platforming / movement together that usually kill you. Boss battles, in particular, can get very intense as you’ll be occupied with damaging them and the other enemies on the screen but you may also need to regularly jump over a plume of fire or avoid some other environmental obstacles. It’s a merging of genre play I can’t say I’ve seen before, and that makes it fun, but it does equate to a lot of dying. Aside from the dying one of the other things that stands out in the game is that some of the stages change up the formula and will then end up feeling like other classic games. My favorite was a span where you lose your ability to aim your weapon so the stage plays out much more like a classic side-scrolling shooter. Another has your main gun disabled entirely and you’ll be forced to very quickly try to hack anything you can in order to help you get through. These variations aren’t typically very long but they do help break things up and are very much appreciated for bringing added flavor to the mix. Outside of the main story and replaying missions the pretty diverse options in Challenge mode are nice variations, and Battle Arena will drop you right into the thick of things if you want more of an immediate fix. All of this is hooked up to global leaderboards and if you have friends playing as well it will keep you up to date on who is ahead which is also a nice touch. 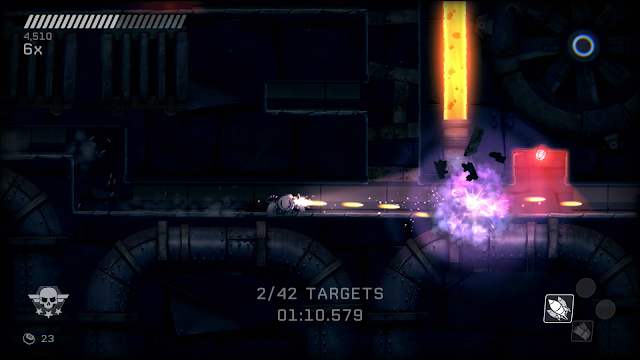 For me the proposition in Rive is pretty straight-forward, you either enjoy being challenged and wanting to throw your controller or you don’t. With repetition, experience, and some luck you can absolutely master the levels the game throws at you, it just isn’t a game you’ll be conquering too quickly as there are many sections that required some trial and error to understand and the action simply doesn’t often let up. Fortunately the checkpoints seem to be well placed and spaced, though in a few cases the way the checkpoints are essentially a snapshot of what was happening at the time you passed through it didn’t work out so well. All in all it’s very much a game with its own rules and style though and if you just haven’t been feeling pushed with your shooters it will happily fill that role for you.